What is Bing Merchant Center? Bing Merchant Center allows you to create a catalog, which includes images and other information about your products, so that your products can display on Bing. Product ads allow you to include product details such as image and price within your ads, delivering key information about the product offers that will help users make informed decisions before clicking on the ads (which often improves the conversions). 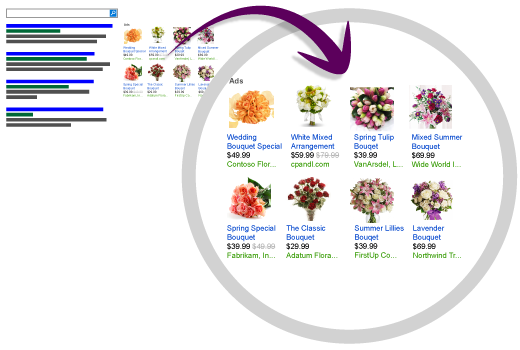 Product ads pulls inventory from the Bing Merchant Center feed files that you submit. This article explains how to get started with product ads. Product ads are only available in the United States on PCs, tablets, and smartphones, and in the United Kingdom, Australia, France, Germany, India, and Canada (English only and excluding Quebec) on PCs and tablets.